Power electronics maker FINsix Corporation has announced the development of what is being called the world's smallest laptop adaptor one that is just a quarter the size of traditional models and just a sixth the weight it comes as a standard wall plug, eliminating the "box on the ground" format so familiar to laptop users. The new adaptor has come about due to the development of a new circuit design by MIT professor David Perreault it's able to run at higher frequencies (between 30MHz and 300MHz-a thousand times faster than conventional adapters) due to a power reclaiming scheme he developed. 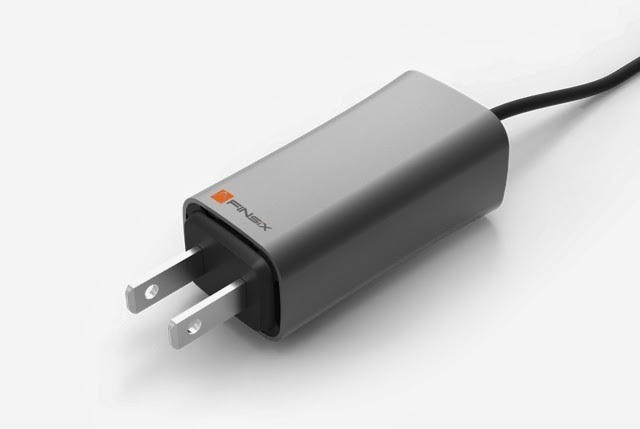 The result is a 65 watt power adapter that can be used to charge a variety of laptops or other devices such as smartphone or tablets (because it comes with a 2.1A USB connector) it can even charge more than one device at a time. FINSix says the tiny adapter is just the first of what will be a whole new line of power electronics devices based on the new circuit design from AC/DC converters to power controllers in devices ranging from air conditioners to more efficient electric motors all courtesy of the increased frequency range. The new design allows for recycling power that in traditional designs is lost, preventing the loss of efficiency that typically occurs with other circuits when upping the frequency range. Representatives for FINSix say the new design (which uses what they call Very High Frequency power conversion technology) leaps over conventional barriers and will pave the way for more efficient electronic devices that are also smaller and lighter. The new adapter which doesn't appear to have a name or price yet, is likely to be extremely popular among laptop users (when it becomes available for sale sometime mid-2014) as it will allow those who tote laptops around to downsize their carrying case and to leave chargers for other devices at home. The company plans to unveil the new adapter to the public at next month's Consumer Electronics Show in Las Vegas where it will be featured as an Engineering Award winner in the Portable Power category.